The start of the new year is a good time to design a new business card. I always have cards handy; in my purse, in my jacket pockets and in the glove box of the car. It is an inexpensive and very effective marketing devise and you never know when you will have the opportunity to hand out your card. I have been known to hand them to someone sitting next to me on a plane. 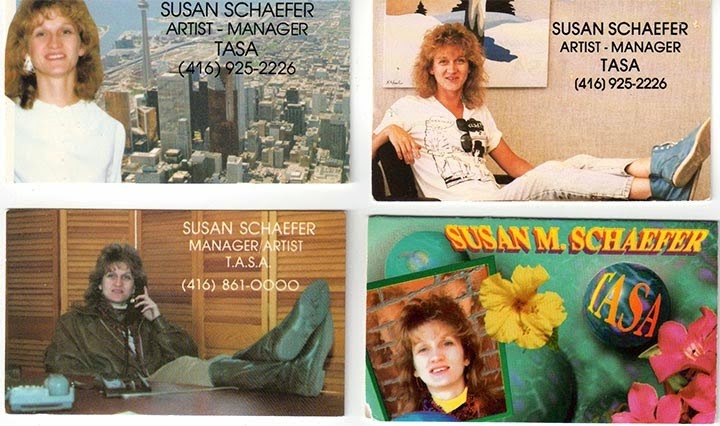 Over the years I have had many different business cards. They have always been very colourful, printed on both sides and on a nice thick card stock. The first group are some cards from my Toronto graphic design days. I liked having my photo on the card, which I felt gave it a personal touch. In those days I went to many 'business after hours' events for networking. There were usually door-prizes and 8 times out of 10 times, my card would be pulled out of the fish bowl. The luck of the draw, possibly, but more then likely because my card was made of a heavier card stock. 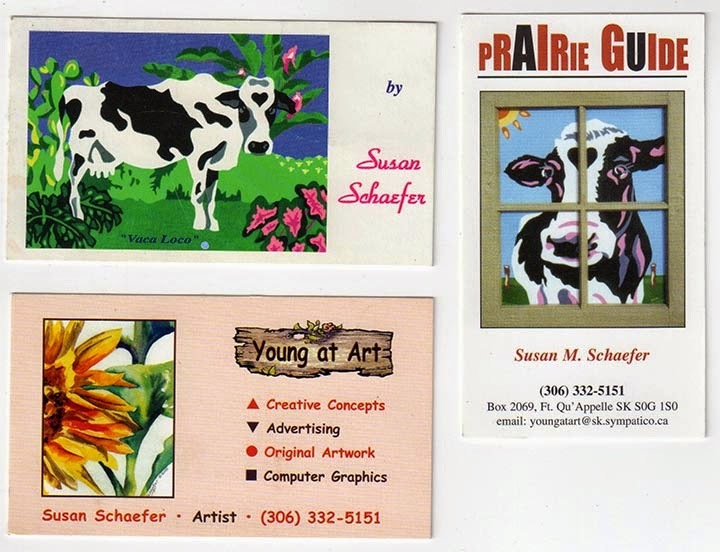 Once I moved to Saskatchewan I started putting my own artwork on my business cards, as you can see by this next bunch. I liked to take advantage of using colour. This is my latest card. 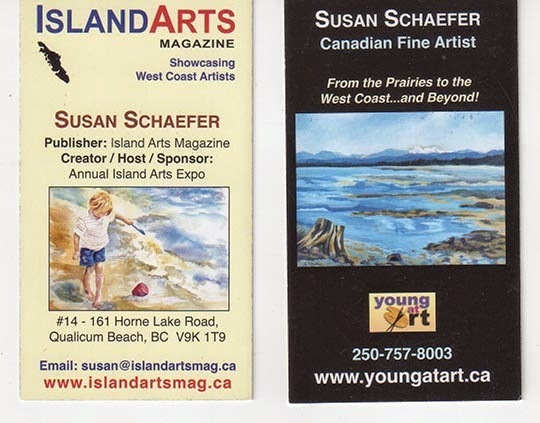 As I am wearing two different hats, the front of the card represents Island Arts Magazine and the back of the card represents Young at Art and my artwork. I like this format very much. For my new card I think I will design something very similar, just using new images. Don't put too much text on the card. Don't use too many different font types. Even though a script font may look lovely, it's often hard to read. When using text on a dark background, the text should be bold, otherwise the background ink will bleed into the text, making it hard to read. 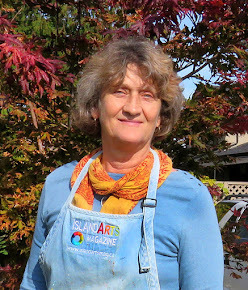 After a Suzanne Northcott workshop in November called 'Working BIG', I finished this painting. 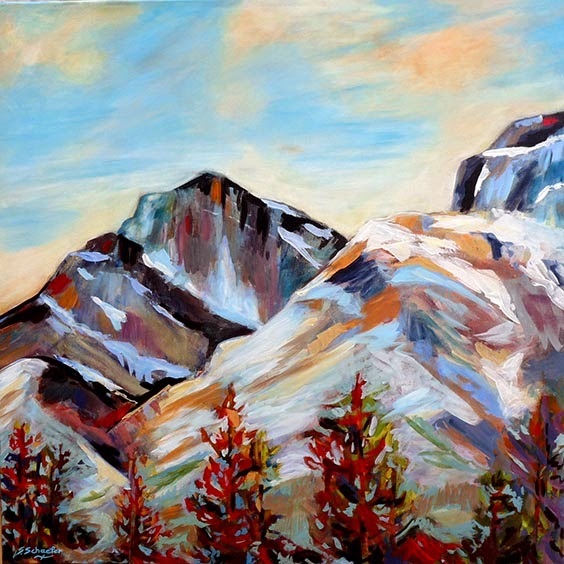 It is called "Alpine Tapestry", acrylic 36 x 36". I signed and photographed it. The next thing was to wire the back. That's when I asked my husband Jeff for help. Having spent a couple of days apprenticing and framing with Don Cameron of the Englishman River Gallery, Jeff knew exactly what to do. As Jeff explains, on a large piece like this it is best to put three hooks in the back forming a triangle. 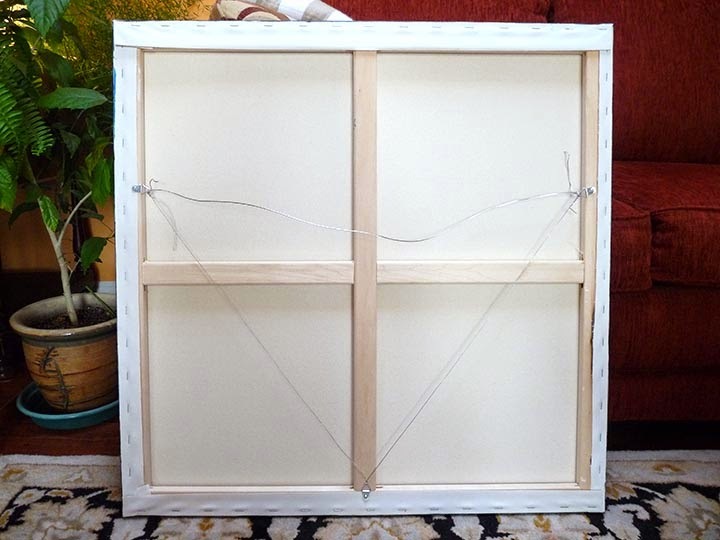 The hook and wire at the bottom is important as it takes the weight off the bottom stretcher, evenly distributing the weight and prevents the bottom stretcher from sagging. Hmmm. ... good to know.